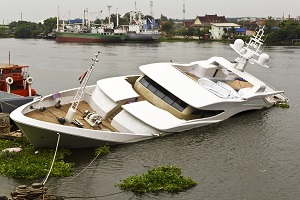 Compensation for Boating Accidents in Florida | Law Office of Andrew G. Rosenberg, P.A. With thousands of miles of coastline, beaches, and inland waterways, Florida is home to more recreational boats than any other state, with over 944,000 vessels registered in 2017. But with so many people on the water, it also means that Florida has more boating accidents than any other state—often tragic accidents that could have been avoided if it weren’t for negligent, careless, or reckless behavior. The Florida Fish and Wildlife Conservation Commission maintains active statistics on boating accidents and cited 766 boating accidents statewide in 2017. Nearly a third of these involved a collision with a vessel. There were 61 fatal accidents and an additional 437 injuries. Seventy-four percent of watercraft involved in fatal accidents were smaller vessels of no more than 21 feet in length, and the number one cause of death in a boating accident was drowning. Operator distraction. Not paying attention to the duties of piloting a craft is one of the biggest causes of boating accidents. Improper lookout. Failure to have a designated lookout to keep an eye on the craft’s surroundings leads to collisions and other accidents. Alcohol or drug use. Almost a quarter of all fatal boating accidents in Florida involved drugs or alcohol. Operating a watercraft while intoxicated is extremely dangerous and puts both passengers and other vessels at serious risk of death. Inexperienced operators. Sixty-seven percent of the watercraft operators who were involved in fatal boating accidents in Florida received no formal education in boating safety. Disobeying rules of the water. Violating navigational rules or other good practices of safe watercraft operation often leads to tragedy. Victims are also often eligible to receive compensation for the pain and suffering or mental anguish they endured as a result of their injuries. In certain situations, an additional financial award for punitive damages may also be granted. Every accident situation is unique, so it’s important to consult with a personal injury attorney to determine your eligibility for this type of compensation. If you or a loved one suffered injuries in a serious boating accident, contact a personal injury attorney. An attorney with experience handling boat accidents will be familiar with boating laws and can investigate your claim, examine the evidence, and present you with your legal options for compensation. At the Law Office of Andrew G. Rosenberg, we understand what victims of boating accidents have been through and what a challenge recovery can be. We are proud to offer our services to those who have been injured due to negligence, and we want to help you and your family through the legal process to get the compensation you deserve. We work on a contingency basis, which means we don’t charge you unless we win your case. Call us, or use our online contact form to arrange a free consultation today.